My neighborhood has a lot of deer nearby. That’s cool when you see a stag and does in your front yard, but it means that no vegetable gardens will go untouched. 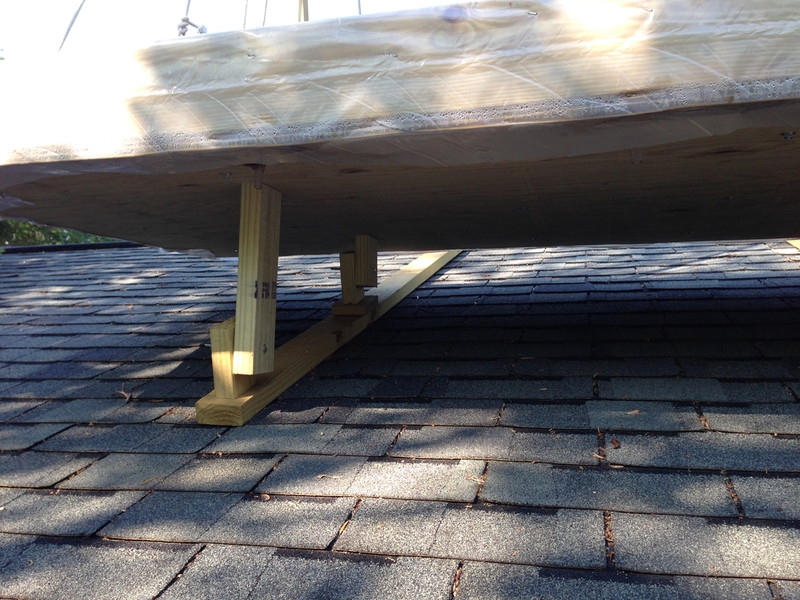 Fortunately, my roof has a shallow pitch, an easy way to climb to the top, and I’m good at construction. I built two container gardens, about 6′ x 3′ x 1/2′. 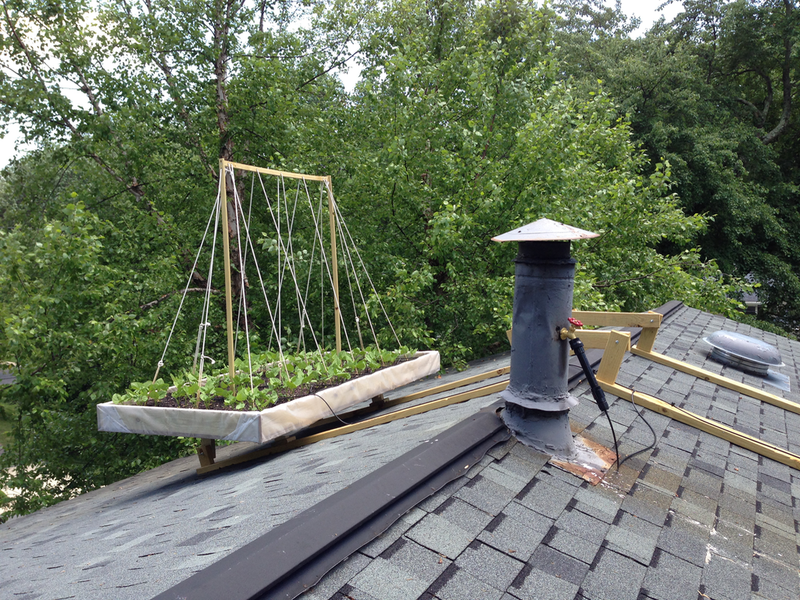 The first has poles and ropes for climbing vegetables, here green beans. The second has wire cages for tomatoes. Each box is held by gravity to the other with a contraption that sits on the roof, rather than being nailed to it. 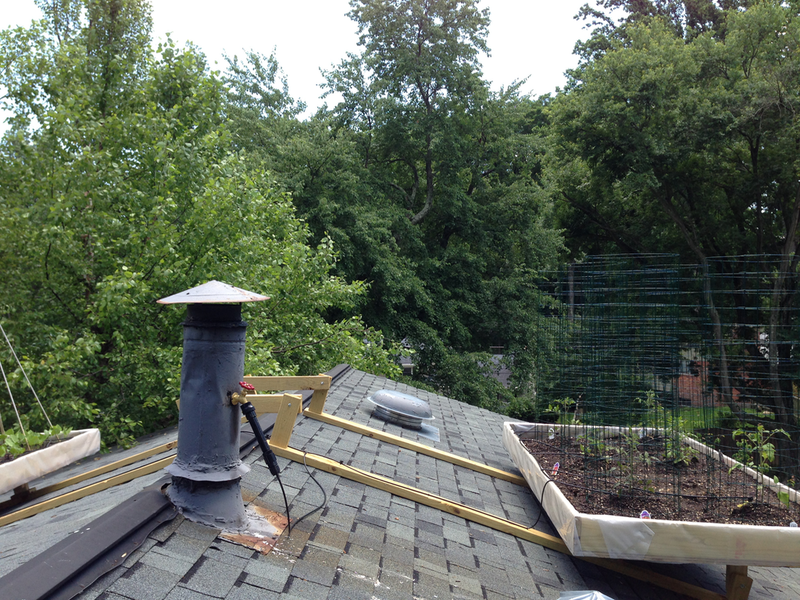 So if the next owner did not like roof gardening, I could easily remove it without harm to the roof. On the roof, my vegetables get constant daytime sunlight, but being in containers means that they would dry out quickly. 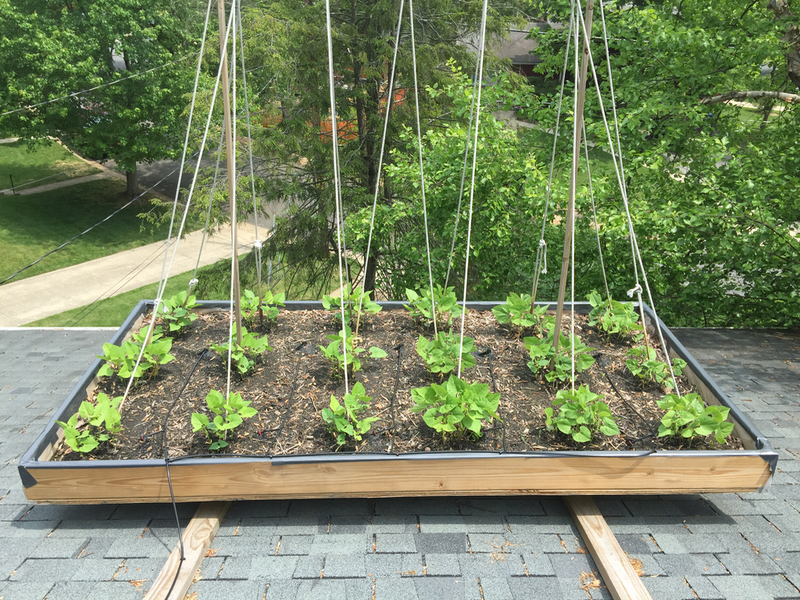 So I ran a copper pipe to the roof and put in a faucet, and then attached a timer and a drip irrigation system to keep both beds moist during the day. This works well, and both beds stay moist. Each bed has a layer of rocks below the soil to aid in drainage, and drain holes so they don’t flood. Inside the beds, there is plastic sheeting to keep the wood from rotting. The poles I first used above were wood and did not stand up to the elements, so I replaced them with PVC piping, which will last for millennia. 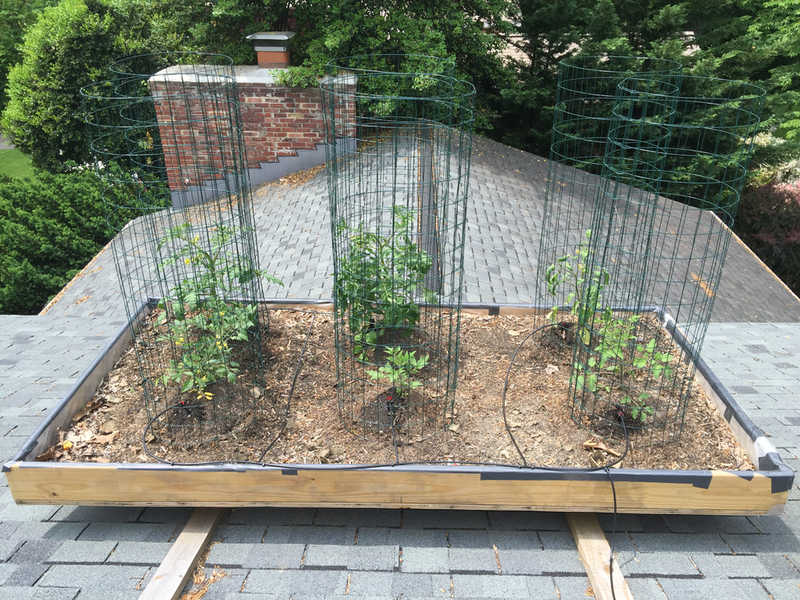 The tomatoes were particularly happy on the roof. I tried a variety of tomatoes, and they all grew well. But the birds love my heirloom tomatoes, so I need to harvest them right when they start to ripen, or I’ll find holes where a happy sparrow had lunch. I found cherry tomatoes did best, and were delicious right off the plant. However, green beans never did well in the pole garden. 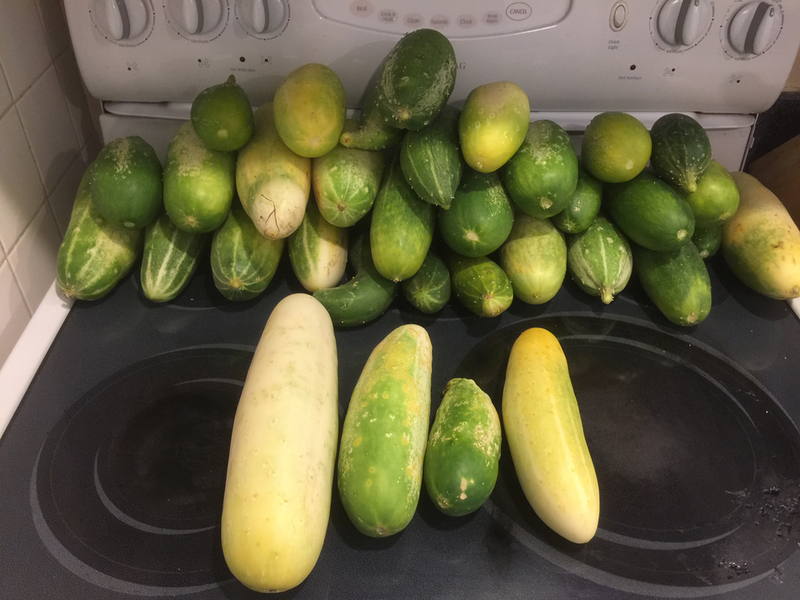 Eventually I tried another pole growing plant: cucumbers. Cucumbers were thrilled to have that much sunlight and constant irrigation. This was one of three large hauls I had this past year.